Internet Archaeol. 25. Williams. Image processing. As well as using different images, it is also possible to manipulate the digital images to enhance contrast and lighting (Lock 2006, 18-20). This can be undertaken at a very small scale, stretching the contrast or lighting through grey scales over small areas to highlight the resolution of the image. Unsurprisingly, different areas of any image will react slightly differently, as will different features. 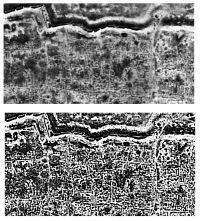 As a broad indicator of the potential, a series of alternative layers were constructed in the GIS to hold different versions of the rectified images (both the Powlesland and the Rutter versions), showing different contrasts: these were created by manipulating the whole image using contrast/brightness filters in Adobe Photoshop (Fig. 18). It is likely that further work on this will involve the manipulation of smaller areas of each image.